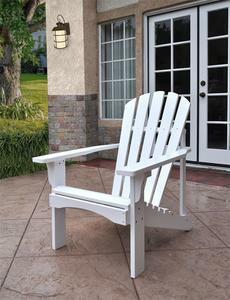 Our Shine Rockport Adirondack Chair has a sleek and simple look that our customers love. Shop Gardentones for all your outdoor furniture needs. This Adirondack Chair is made from beautiful cedar wood and available in a wide variety of painted finish colors from Dutch Blue to Taupe Grey and Leap Frog. Create a rainbow of colors in your backyard by ordering one in every color. The hardware used is a galvanized steel which is rust resistant. - Quality Cedar Wood - Resistant to Moisture, Decay and Insects. Note: We recommended on our natural unfinished cedar wood that you apply a wood sealer to protect the wood from the elements.